WASHINGTON - At 5 a.m. on June 25, 1988, after five days of tense negotiations, officials from the presidential campaigns of Michael Dukakis and Jesse Jackson emerged from the library of a Washington law firm with an agreement. The team had reworked the rules for picking a Democratic Party nominee, creating an elaborate framework for selecting delegates based on proportion of votes in states and congressional districts, with an additional role played by party elders. The guidelines hammered out by the two campaigns assured peace between the Jackson and Dukakis camps at that summer's convention in Atlanta. But now, as Hillary Clinton and Barack Obama fight down to the last delegate, changes that were meant to make the nomination process more inclusive and ultimately more conclusive may be accomplishing neither goal. Democrats who participated in a series of reform commissions between 1968 and 1988, when controversies over delegates regularly roiled the party, said they are surprised and even chagrined that the patchwork of rules assembled over that time could create so much uncertainty about the party's nominee. "This is the nightmare" that all the commissions sought to avoid, said consultant Bill Carrick, who was part of the 1982 reform panel. With primaries in only 16 states remaining, it is unlikely that Clinton or Obama will clinch the nomination based solely on delegates elected by voters under the process devised in 1988. That would leave the nomination in the hands of the party's 795 "superdelegates," who constitute party insiders. And it was exactly such an outcome - a nomination decided by party elites instead of grassroots voters - that prompted the two-decade saga of reform commissions and internal party bickering that began after the tumultuous 1968 Democratic convention in Chicago. For its first 150 years, the Democratic Party selected its presidential nominee in a proverbial smoke-filled room, with delegates picked by party bosses. The system began to change in the 1940s and 1950s, when a handful of states including New Hampshire established primaries to give voters a say in the selection of delegates. Still, in 1968 it was possible for Vice President Hubert Humphrey to win the Democratic nomination over antiwar candidate Eugene McCarthy without winning any primaries. Humphrey's selection enraged antiwar demonstrators, who clashed with police outside the convention hall, a nationally televised spectacle that sparked calls for party reform. The next year, party leaders named Senator George McGovern of South Dakota to head a panel to overhaul the delegate selection process. David Mixner, a McCarthy supporter who had been beaten by police at the Chicago convention, was named to the commission as a 20-year-old. He said the "overriding purpose of the commission was that every delegate should be representative of people's votes." The commission required states to publicize their delegate selection rules and adopt quotas for women, minorities, and young Democrats. The commission also recommended abolishing winner-take-all primaries. But the McGovern reforms, like each successive attempt at reform, had unintended consequences. By abolishing the tradition of giving party leaders seats at the convention, the number of senators and congressmen who served as delegates tumbled. Some said that weakened party unity in 1972, causing officeholders to feel less invested in the party's standard-bearer. "The party officials were left out of the convention, and, frankly, many of them did not campaign very hard for the party's nominee for president," said James B. Hunt, who was elected lieutenant governor of North Carolina that year. The McGovern rules, with their emphasis on bringing young people and minorities into the convention, also produced a delegation with far fewer labor leaders and traditional activists who had long been the backbone of the party. The vagueness of some parts of the guidelines caused rancor at the 1972 convention in Miami. Most states had followed the commission's recommendation to abolish winner-take-all contests, but others, including California, had not. McGovern won the California primary, ensuring his nomination but enraging his rivals. Meanwhile, some states including Illinois had simply ignored the McGovern recommendations. A floor fight over the seating of the Illinois delegation ensued, pitting legendary party boss and Mayor Richard J. Daley of Chicago against a 31-year-old Jesse Jackson, leader of the reform slate that eventually prevailed. In reaction to the tumult, the party named another commission in 1973 to clarify the rules. Chaired by City Councilor Barbara Mikulski of Baltimore, the commission scaled back some of the affirmative action provisions in McGovern's rules and explicitly prohibited winner-take-all primaries. Another commission in 1978 considered, but rejected, a proposal to give seats to elected party officials. By 1980, however, the number of Democratic senators at the convention had declined to 14 percent, down from 68 percent in 1960. Elected officials complained that they were forced to run against their own constituents for seats at the convention. That year, Senator Edward M. Kennedy of Massachusetts challenged President Jimmy Carter in the primaries. Kennedy mounted a series of rules challenges against Carter at that year's chaotic convention in New York City, triggering another bout of Democratic soul-searching. "There was a palpable sense that this rules fight was really taking the party down," said Elaine Kamarck, who worked for Carter that year. "People felt, if only there had been more elected officials on the floor of the convention, maybe they could have short-circuited this." The party responded by creating yet another commission. Hunt, who had since been elected governor of North Carolina, was named to head the panel, which recommended scaling back many of the 1970s reforms. The commission permitted states to hold primaries that were effectively winner-take-all. Hunt's commission also voted to give Democratic senators and Congress members automatic seats at the convention. "There was a strong feeling that if we're going to have a strong Democratic Party that has a good chance of winning the presidency, we need to have the party's leaders involved," Hunt said. At the same time, the commission also slipped in a provision making members of the Democratic National Committee - the body that had to approve the reforms - superdelegates. But the Hunt commission left the role of superdelegates ambiguous; some felt they were merely invited to strengthen party unity and validate the results of the primaries. Jackson, who made his first run for president in 1984, complained at the time that the rules had been "stacked" against him by organized labor and Democrats aligned with Kennedy and former vice president Walter Mondale. 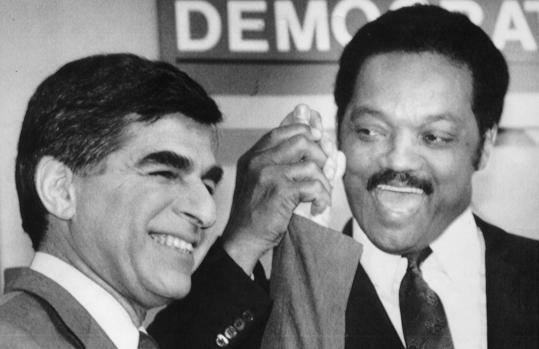 In the 1988 election, Jackson complained that in Pennsylvania, Illinois, New Jersey, and other states that awarded delegates on a winner-take-all basis within each congressional district, he had been deprived of his due share of delegates. "We raised hell about the unfairness of the system that was in play," said Steve Cobble, Jackson's delegate director. Dukakis eventually agreed to many of the changes Jackson wanted. Jackson's negotiators, Ron Brown and Harold Ickes, won an agreement to remove DNC members as superdelegates and mandated proportional representation as the only permissible method for states to apportion their delegates. After Dukakis lost the election, however, Brown - then the newly elected DNC chairman - reinstated DNC members as superdelegates. "Ironically, Ron Brown undid the reform that he had helped to negotiate," said Tad Devine, who negotiated the 1988 pact for Dukakis. Since then, the rules have been essentially unchanged, except the number of superdelegates has drifted upward. When the Hunt Commission created superdelegates in 1982, they constituted about 15 percent of all delegates; since then, their ranks have grown to include some big city mayors, former DNC chairmen, and former Democratic presidents and vice presidents. Superdelegates now constitute 20 percent of the total. As Clinton and Obama face what could be a protracted struggle for support among superdelegates, critics have questioned the power granted to so many party insiders who could be in a position to crown the victor in Denver, echoing many of the concerns voiced in 1968. The McGovern reforms "have been watered down significantly by this superdelegate stuff," Mixner said. "Any time you have that number of delegates that are not elected by the people it's wrong. It's just wrong." Carrick placed part of the blame on the proportional representation rule imposed in 1988, which he said makes it mathematically difficult for a winner to emerge from the primaries and therefore made superdelegates more important. "The unintended consequence has been to make it harder to get a consensus as to who the nominee should be," said Carrick, who supports a return to some winner-take-all primaries to hasten the process. Jackson has criticized superdelegates since their creation in 1982. "The same people who complain about Electoral College strong-arming can't very well have a de facto Electoral College," Jackson said. "That would be suicidal." Jeff Jacoby What would JFK do?